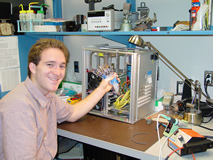 Paul Linden is currently a senior in the Electrical Engineering program at UH Manoa. He is from Hilo and lovse to hike, dive, and camp on the Big Island. Paul works in the machine shop at the Institute for Astronomy. This has given him a lot of practical hands-on training in a professional environment. He plans to continue on to graduate school and most likely in biomedical engineering. Paul’s senior design project has to do with hear auscultation, or listing to the heart with electronic instruments. This field interests him greatly and he may pursue it at the graduate level. The NASA Infra Red Telescope Facility(IRTF), located at the summit of Mauna Kea, uses a 3 meter primary mirror designed to observe in the infra red spectrum. A 36 element adaptive optics(AO) system is one of the instruments that IRTF is equipped with. The diffraction limit can not be fully realized because of atmospheric turbulence limiting the actual angular resolution achieved. AO attempts to correct for these atmospheric turbulences allowing for an angular resolution closer to the diffraction limit. The goal of this project is to clone the existing AO control electronics used by IRTF as closely as possible. The AO control electronics includes a variety of electronic equipment all of which require power, ventilation, proper mounting, etc. and all of which are enclosed in a single chassis. This replica system will be made by examining the original system and its documentation. With this step completed, the necessary power-supplies, controllers, cables, etc, must be ordered. The chassis for the system will require machining and electronics work in order to mount and link the many subsystems enclosed in the AO crate. Once completed, an exact replica would allow IRTF to optimize the 36 element AO system for better viewing without risking a loss in observing time and add redundancy to the original system by serving as a “drop-in replacement” should the original fail.